Is it possible to refinance out of a wholesale mortgage? Yes. It doesn’t matter if the mortgage comes from a mortgage broker (wholesale) or via a retail bank. That won’t affect your ability to refinance the loan. And if you originally used a broker, you can refinance with a retail bank. Or vice versa. So shop around! I tried both the bank and broker route, and found that the broker I wound up working with was more personable, helpful, and he got me a lower rate. Just my two cents, I’m sure the experience can vary. Thanks for showing the positive side of working with a broker. Yes, there are still good reasons to choose a broker over a bank, despite the former being public enemy #1 after the mortgage bust. I prefer the personal attention and reliability of working with a broker. I can call mine up night and day. The banks don’t care about customers these days. They’ll promise everything upfront, and then are nowhere to be found when it comes time to get the deal done. The downside is that brokers are sometimes the pricier option. I’ve been using the same broker for years. He always has access to the best loan programs, and keeps abreast of the latest industry regulations so I don’t have to worry about getting approved for my mortgage, regardless of the underwriting changes that take place. And his pricing is always competitive. Why deal with a bank when you have your own concierge service? Do brokers still exist? I heard their market share fell to another all-time low. Soon a retail bank will be your one and only choice for a mortgage. Try getting a banker to call you back when you need to lock your rate, or guide you through a difficult approval. Most of them rely on a computer to tell them what to do. I lost my job a few months back and as a result I became delinquent on my current FHA mtg (3mos) and 1 month behind on my car note. This lowered my score from 700s to low 600s. I got a really good job offer and start next month. I want to buy a home in my neighborhood that is a really good deal. seller will not do seller financing. Can I still get a mortgage? Speak with a broker or two to see if they work with any lenders that can help you. It’s generally pretty difficult to get a mortgage with recent mortgage delinquencies and gaps in employment, but take the time to look around to see if anyone can make it happen. My home is financed by a seller through his IRA plan. I am behind on my payments due to loss of job and about to go in foreclosure. I have contacted many mortgage companies, securing help, but since home is financed through sellers IRA, no one can assist me. Can you give me some insight. time is running out. Presently, I am in a temporary position and salary is low-scale. What have the banks or brokers you contacted said was the issue specifically? And have you tried working with the seller directly? I am just finishing construction of a new (second) home, and am shopping around for rates now. Does moving from a construction loan to a permanent loan necessarily make mine a complicated loan procedure? Is there any reason I should not look at mortgage brokers in this instance? And I would be looking at a “refinance” — right? not a new purchase loan? My construction lender does offer perm loans, but I feel like I can do better elsewhere. I welcome your advice. Any loan can be complicated if don’t prepare for any potential red flags and address them accordingly beforehand. And a construction loan can certainly add more potential issues. It should be designated as a refinance if you were the owner of record of the land before securing the construction financing. A broker could actually be a good option in your case because they tend to know the guidelines best and can shop your rate with multiple lenders all at once to find the best pricing. But it’s generally recommended to try all routes (broker/bank/credit union) at once to ensure all options are exhausted. Simply accepting the construction lender’s rate wouldn’t give you the full picture of what else is out there. A broker could be beneficial in that they can educate you about the process while also shopping your loan program/rate with a ton of different banks. But it’s got to be an honest, knowledgeable broker, so results may vary. A bank may just write you off and/or provide little support if you run into any snags as a first-timer. If your loan is straightforward either should be fine, though you should shop around just to ensure you get good a good rate and low fees regardless! Is there alot of different in big mortgage brokers (ie Aussie Home Loans) to the smaller companies? Are the bigger firms more reliable? There can be a lot of differences from company to company, and even between loan reps under the very same brokerage, so it’s hard to ever achieve a consistent experience. It also depends on you and your loan. If it’s easy, all might go well and be smooth. If it’s not as straightforward, you might have a negative experience. The best thing you can do is talk to your broker and get everything ironed out upfront, before you proceed. Interesting information Colin. I worked as a wholesale rep and currently employed with a bank. I googled this out of curiosity to get an idea how mortgage brokers are doing. Great information. Having both wholesale and retail experience; your point of view is right on! However being in the industry for over 16 years working both I find fault in what you are saying regarding big banks maybe hard to find someone to pick up the phone or give personal service. That goes both ways. It’s not the mortgage banker or the mortgage loan officer to trust; it is getting the right loan rep that truly has your best interest in mind! The money will come later. That’s true, but with a smaller brokerage or one-man shop, it’s easier to get in touch generally, than say, a large bank where you never actually meet the person or even know what they look like. But results can and will always vary. I always suggest exploring both avenues for this reason and others. i have good credit now but my husband and I filed for bankruptcy almost a year ago due to bills encored in his previous marriage. That is what has hurt us on getting a home loan and I am tired of paying rent into a property that I am not building any equity into. Do I have a better chance for financing with a mortgage broker? A broker can certainly dig a little deeper into your situation and then determine if you’ll qualify with one of their many lending partners, whereas a single bank is just a single bank with far fewer options. Additionally, a broker may have recommendations to improve your credit and/or finances to strengthen your chances of approval. We have a small mortgage on our present home which my wife inherited. We would like to sell. But we have found one that we like, but we have never bought a house and I have been self employed for 24 years. Is everyone afraid to work with the self employed and is it possible to get a mortgage when you already have one? Check out my page about qualifying for a mortgage. Being self-employed can make things more difficult, but shouldn’t hinder your efforts too much assuming you’ve held the position for several years and make enough money to qualify for the payment. Yes, you can get another mortgage but you will need to prove that you plan to occupy the new home, assuming you want to get an owner occupied loan. Is it a bad idea to use a broker if you don’t want to work with a large bank? Our big bank has been horrible. We’re in the process of switching over to a local Credit Union. Do brokers work with smaller, less sleezy lenders like credit unions? Credit unions can be a great alternative to a bank, though they only have their own rates and loan programs. A broker can be good or bad depending on the individual you work with. Brokers work with a variety of different banks/lenders, from small to big. But it depends who they are approved to work with so results may vary. Outstanding article and discussion. You present the pros and cons for using a broker or a bank, without bias towards either choice. The banks have the advantage of more control over the process, where the brokers have the ability to search for more avenues for a particular loan. I have seen very intelligent and competent mortgage professionals in both the bank and broker sector. I do believe that brokers are going to reemerge as most large institutions are wary of offering Non QM loans. Hi, Thank you for the article. I’m looking to refi….I currently have a mortgage through a credit union that my employer (a university) is affiliated with. How do I find a local mortgage broker to work with? (I don’t just want to do a random, internet search to find someone). Generally people ask for referrals from friends and family members who have used a broker they liked working with in the past. Is there a reason you want to use a broker? My father in law co signed for mortgage for my wife and myself. We’re paying almost $300 in PMI and are currently at 4.375% on a 30 fixed FHA. Now I wanna get him off the hook. My bank is telling me with a streamline they can give us 3.75% and drop down the PMI due to a new program with no cost or fees. It sounds too good to be true, but I received an email stating exactly that. I was told I could save $300+ a month and they won’t restart the loan, it’ll just continue. My broker said he can lower my payment $150 a month a get 4% rate for $1800 which he could roll into the mortgage. What should I do? When I asked the rep at my bank how is it possible to get such a great deal, he basically told me they were willing to do it so they can basically keep my business and collect my interest. I love that he was being honest, but am I missing something? Is this even possible? One thing to consider is that the mortgage insurance may be in force for the life of the new loan due to new changes at the FHA. I’m a 28 year old, 1st time buyer and I’m terrified. Does anyone have any computer resources I should read. To become more understanding of this mortgage process. Hopefully my site has enlightened you somewhat. Keep researching and reading all you’ll get the hang of it. Good luck! Hi Colin, Thanks for the article. I have a situation where I am getting conflicting information. We have a property that is in an irrevocable trust. We need to get some funding to take care of an elder parent. The trustee tells me that it is not possible to refinance a property in an irrevocable trust, therefore she wants to sell the house. So I am trying to educate myself and I am researching online. I have spoken with a credit union that says it is possible to refi. And I have spoken with a broker who said it may be possible but could be very difficult. I would rather refi and retain ownership for as long as possible. We could always sell later as needed. If you have any thoughts or advice, I would appreciate your reply. It might be helpful to speak with a few banks/brokers and find one that has done it before. I’m pretty sure not all lenders will do it. hey colin, thanks for the article. I have a question ? It’s possible to mortgage 2 houses with 2 different banks/lenders ? Last year i and my brothers bought a house but later we moved out to apartment leaving the house to my sister’s family. we still pay the mortgage and my sister gives back the money every month. Now we like to buy another small house for me and my brothers. Is it possible to mortgage 2 houses with 2 different banks/lenders ? can i ? Thanks a lot Colin. It’s possible to have two mortgages from two different banks on two different properties, but one will be designated as a second home or investment property and the one you live in will be primary. In 2013 I took a job out of state that required me to relocate. I paid my regular mortgage all while renting a home in the new state I resided. I placed the house for sale because I could not afford to pay both the mortgage and the rent. Once up for sale I could only get offers 50% below what I owed so I was forced to short sale the house. It has been 1 1/2 years since the foreclosure finalized and my payment history in the past 3 years is flawless (except the foreclosure). I currently have a 681 credit score and climbing. Is there any hope to be approved for a mortgage? Potentially, though you may have to go through a portfolio lender that allows recent short sale activity, meaning interest rate will likely be higher. Hi Colin, great article lining up the pros and cons in a very balanced fashion. This is probably a silly question, but we are moving from Portland, OR to the Seattle area… should we be looking for lenders/brokers in the area we are moving to, or where we live now for convenience? Furthermore, we are self-employed but have great credit. Is a mortgage broker our best option? Your tips and suggestions are greatly appreciated. Thank you for your advice! As the article suggests, you can go either route, though if you use a broker you might want someone local that you can meet up with to discuss your finances. Self employment isn’t a huge issue if you’ve been doing it for a while and you make decent income (and have good credit). Compare pros and cons of both along with rates and costs. Good luck. Colin, do mortgage brokers still exist? They exist…they nearly went extinct but have since come back and are gaining market share once again. The problem I’m confronting is not choosing a broker vs. a bank. It’s finding a lender I won’t regret doing business with. Most of the reviews I read online — both for banks/credit unions and for wholesale lenders that a broker I spoke to says he often uses — seem to be one-star tales of woe about how horrible the customer service is: payments not credited, errors made, rude or uninterested customer service people, inability to even get anyone on the phone. I’m reluctant to put myself in a position where I’d have to deal with that kind of aggravation, even if the loan is cheaper. Are there any lenders who are known to provide good customer service — and have reviews to prove it? Welcome to the wonderful world of mortgage…thing with this industry is it’s not like every other industry…so all the expectations customers have go out the window. In any other industry you’d be able to get on the phone with the customer service department and make things right. In the mortgage industry you’re often just happy to close, even if things go awry along the way. Cynical but true. Best you can do is ask for referrals and make sure the company/broker has a overall good track record, then be a good customer and do what is asked of you in a timely manner. Lastly, the squeaky wheel gets the grease, so speak up early and often if necessary. Thanks. Looking online, I’m having a hard time finding anyone with a good overall track record in customer service, and in reviews, people are always saying they spoke up early and often and it did no good whatsoever. I don’t understand why lenders do this — it seems pretty self-defeating. Is there anyone you can recommend? No one offhand unfortunately. It is frustrating because individuals can have a completely different experience while working with the same exact bank/broker because each loan is unique…so it’s really hard to pick a winner. Best one can do is feel the person out, read reviews, ask for referrals, ask smart questions early on, and work with the person to make the process smooth. It is possible and smart to combine my mortgage loan with my student loans? It depends on the rates of both loans, how far along you are on your existing mortgage, and if you qualify for a refinance or home equity line to cover your student debt. Also consider that failing to pay your mortgage could mean foreclosure, whereas falling behind on student loan debt may only result in wage garnishment. Do the math to compare options to see if it makes sense. I can’t vouch for anyone in particular – probably best to research yourself and ask for referrals. Sorry and good luck! What about the Direct Lenders that is in between the local Mortgage Brokers and the Big Banks? What do you think the Pros and Cons are? newly widowed and now learning finances, is there a way to pay off the mortgage still owed on my home ( 43K ) . my loan is with a bank. would it be wise at this point to seek a mortgage broker? You can pay it off if you have the money and want to pay it off, or you can just continue paying it as normal if the rate is reasonable and you have other uses for your cash. There’s also the option to refinance the mortgage if the interest rate is high, but that would start the mortgage over again with a brand new term, something you may not favor if you want it paid off sooner rather than later. There are many options so you may want to sit down with a broker, lender, advisor, etc., but it’s also good to educate yourself so you know the advice you receive is sound and aligns with your goals. Good luck. Hi Colin, you advise to shop around for a mortgage. Doesn’t it affect my credit score when several resources are checking my credit to approve or disapprove a loan? Actually FICO has adjusted their algorithm for this purpose and ignores mortgage inquiries made 30 days prior to scoring. And it groups mortgage inquiries within a certain shopping period as a single inquiry. We are looking to refinance and deciding whether to go through our existing loan institution, ie. Wells Fargo, or talk with a broker. We are thinking of consolidating another loan into the mortgage and we need extra money for home improvements. Would this be easier dealing directly with the bank? It might be easier to work with your bank, but you might find a better deal elsewhere with better service to boot. I think folks should always shop around a bit to see what’s out there, as they would any other product. And there’s certainly no guarantee it’ll be easier to use your bank over any other bank, lender, or broker. Hi, I am trying to get loan from the mortgage company. Would you please let me know what are the fees and how do we know what fees should be pay to these companies ? I know one guy who is a senior loan officer and I am wondering about the fees associated with this loan process. Any suggestions / insights would be very helpful. It depends on the type of loan and what lender fees they charge. Generally you have the origination costs, underwriting/processing, and then third-party fees, which are either paid out of your pocket, rolled into the loan amount, or paid by the lender via a higher interest rate. Colin, my husband and I want to purchase our first home. I read all the comments about brokers vs banks. I understand their differences. 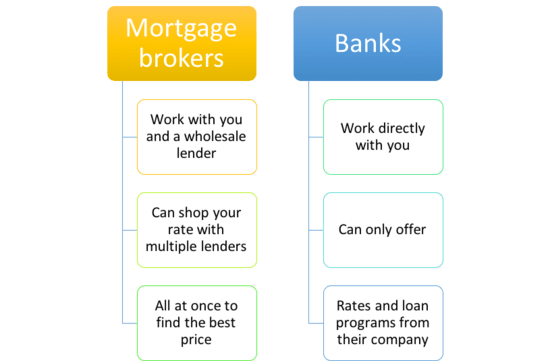 Does a mortgage lender differ from “brokers” if so how? As you noted, you understand the differences. The differences were discussed above in the article. In a nutshell, a broker can offer rates/programs from multiple lenders whereas a single lender only has their own products to offer you. Both of them have their own pros and cons. But if you need personal attention and advice in terms of a home loan than mortgage broker is a good option for the borrowers. But I would rather suggest it is always better to educate yourself first in terms of home loans and the current interest rates, also what are the future scope in case you go for any 1 one them in future, and ask for good referrals before making a decision. My husband and I want to obtain a mortgage in near future. We have run a new business for the last 24 months. We show a profit before depreciation. I contacted our bank which we have held a mortgage for last 10.5 yrs with never a late payment. Our credit scores both are in the mid 700’s only due to start up fund debt for the business. Our current bank will not approve due to showing the “paper” loss of business. Do you think a broker would be successful in our circumstance? We would be selling our existing home and paying mortgage off in full. A broker might be helpful in a situation like yours. Generally bank loan officers aren’t as resourceful as brokers, and brokers aren’t limited to just one bank, like bank officers are. credit that should not be there. Is it better for me to talk to a broker vs a bank? If you don’t have a specific property already lined up, it would certainly make life easier if you worked on your credit score(s) before applying for a mortgage. Some brokers are knowledgeable about credit scoring and can help clients improve their scores before applying, but you can also do it yourself. I’d say that issue is more important than choosing between a bank or a broker. As for the reasons, I explained them as best I could in the article above. Good luck! I have a USDA home loan. I’m wanting to purchase land and build for primary residence elsewhere. If I sell I have to pay back all the subsidy. Should I just refinance with another finance co. or do a short sale. I also thought about renting the property instead of selling. Please give me your opinion. Can I do both?? Can I apply thru my credit union and seek the help of a broker?? Will it hurt my credit score if they both do inquiries? It’s generally recommended to get several quotes to ensure you weigh all your options and get the best deal. And multiple mortgage inquiries in the same period count as a single inquiry so it shouldn’t hurt your score. Good luck! What is the one question I can ask my broker to see if they are trying to increase their commissions rather than offering me the very best rate? If I am going to get a great deal, what should I expect to pay my broker for their efforts? Hard to say really…the only way to assess whether a deal is good or bad is to compare it to other offers. You can check your paperwork to see what you’re being charged in the way of lender fees and compare that to other lenders. You also have to consider the interest rate though and the loan type to compare apples to apples. We have a a rented condo that we want to refinance. Problem is it has one investor who owns 70% of the units and rents them out. How do we a lender who will refinance such. Me and my significant other are buying home and we went through a credit union. We both have good credit but she has a high debt to income ratio. She works 2 jobs and they wont count one of them because she’s only been there a year. They approved me by myself but for far less then we’d like. My question is, can a broker work with us somehow to add that income or is it still the standard 2 years at the job? A broker may be able to explore different loan programs to include that income…whereas one credit union may abide by one set of rules with no ability to shop your loan scenario. My credit score is at 709. I am making decent money but my last years taxes dont show it. I have minimal debt but have only been at my job since april. Can i get a mortgage loan? Also, how do i shop around brokers? Let them keep checking my credit? It’s possible but the brokers will have to parse all the details – you don’t have to let them run your credit. You can tell them to look at everything else and ballpark your credit to see if you even qualify then go from there. GL. Seeing that you’ve got lots of questions a broker could be a good choice to guide you through today’s loan process and also shop your scenario with a variety of lenders at once to find a suitable fit. Perhaps your credit isn’t bad as you mentioned because the missteps took place so long ago, but at the same time you may have no recent credit history, which can also be an issue. Good luck. Where does the mortgage broker’s fee come from? How does he/she make his/her money? Do both type of brokers have the same license requirements? Or does working for a Bank cover that aspect for the employee? We are self employed and make an average of $8k a month over the past couple years. We will be done paying off our land we bought (7.3 acres) and will have electric, septic and leach, well, propane and driveway completed and paid for also. Comps show around $140k for our land. 750 credit and $30k in the bank. We want to get a construction loan and get our house built on the land so eventually it will roll into a mortgage. We need stated income loan. It would be our primary (and only) residence. We are overwhelmed and worried we won’t be able to put a house on our land after all our blood sweat and tears (our original plan was to move our manufactured home to the property but the county changed the zoning rules after we bought the land and that is down the drain. Can a mortgage broker help us? How do I find a good mortgage broker in my area? You can try referrals from friends/family, someone your real estate agent recommends, or browse local brokers via sites like Zillow. Just be sure to vet everyone, and what they offer you, even if they come highly recommended! I am a first time home buyer. I was left with bad credit from my ex-husband but have been building it up the last two years. (never missed payments and paid extra on all bills) Do I have any chance of getting a mortgage? There are loan programs for borrowers with scores in the low 500s…so don’t be discouraged. Just know mortgage rates are better for those with better scores. Of course, you might be able to refinance eventually once your credit improves, or you might even be able to obtain a low rate today because rates are currently so favorable. Can you please tell me what happens if a lender sells your mortgage to someone else and how can you protect yourself from this? I have worked for banks for 15 years and I can quite confidently say that Mortgage Brokers are consistently the best way to go. Here is why. 1. Brokers are better educated and more experienced. not just the mandatory testing, most brokers have worked in the business longer and have ventured away from the bank because they prefer to have control and don’t need the branch to feed them business anymore.. You are rolling the dice with a Banker, most are just order takers and cannot pre-underwrite a file correctly. Even the good ones have far less control over their loan process. 2. Brokers have better resources. They can work with multiple investors to find the best product and price for your situation. Pricing tend to be better as well, After Dodd Frank broker have to set there lender paid fee in advance and with the new LE rules they are bound to it. Most brokers have less overhead, fewer bureaucratic layers, lower fees and higher payout per deal at the same pricing point. 3. Brokers truly do care about the customer experience. Banks just pretend to. This makes a huge difference. Banks try and fit every customer into a box, or a process and every loan is just 1 of thousands which leads to over conditioning, and poor communication. sometimes they go smooth, but when problems arise, Banks are slow to react. At a Bank, if a client gets upset, another comes into the branch soon after. A brokers risks primary referral source is their reputation and so great customer service is crucial. Any good realtor knows, Use a broker. Your chances of having a bad lending experience are much higher with a bank. You make some good points, though on number 2 about setting compensation in advance, they can easily set varying compensation levels cross 3-4 different banks and still get around that rule. Colin, I own a restaurant. Been open for 2 years. Been a owner for last 10. My credit score is about 780 but show less then what I truly bring home. What do you think is my best route in getting a loan done? Thank you..
You may want to speak to a broker or two to determine how much income can be used and what that qualifies you for. They have worksheets to determine self-employed income. I have a rental property that is paid in full. I need to do some repairs such as flooring, roofing and garage work. I was thinking of putting a mortgage on it so i can do these repairs. is this a good idea or is there another way? It might be possible to pull equity on the rental or perhaps pull equity on your primary, if the rate/terms are better, which is often the case. However, it depends what you’ve got going on with your primary mortgage. A broker might be able to help you map out some different scenarios, like a new first mortgage or a home equity line/loan, and determine what’s best for your situation.